Advaita Bhushan (Vishal) is a private detective. He is exceptional at his job and is also a good samaritan. He won’t take up a case unless it interests him and it’s beneficial to a family or to the society. A series of events occur in the first three episode - a man dies due to lightning, a cop dies after a sting at a cinema hall and a dog dies. Rest of the story is all about how he takes up the case of a small kid who comes to him to find his dog killers and connects all the dots! 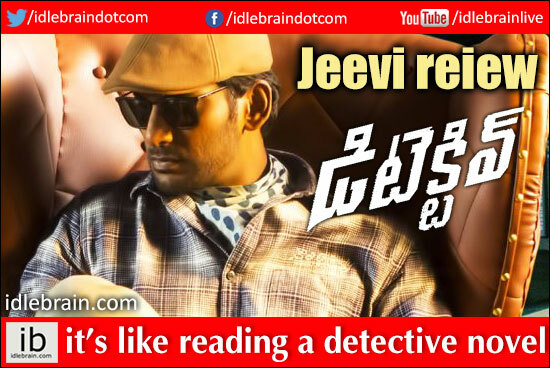 It’s a completely different film for Vishal who has a mass image. Vishal does extremely well as a restless genius. His action orientation comes in play in many fights. His getup is different and his body language too is unusual in this film. Anu Emmanuel plays female lead and her character is limited. Prasanna plays the role of Vishal’s assistant friend. Vinay Rai is impressive as the main villain. Andrea Jeremiah is effective as lady assassin. Story - screenplay - direction: The story of detective is straight out of any detective novel. The approach, orientation and color tones are very different. The screenplay of the film is good and the first three episodes are connected to the climax of the film. What doesn’t work in this good screenplay based film is the orientation. There are key scenes at regular intervals. But the narration style is weird at times and disconnects audiences from the basic plot of the film. The weird orientation to villain’s gang reminds us of Hollywood films - villain’s gang using a traveling agency as front, baddie delivering a red sofa to give contract killing assignment, cooking while discussing killing strategies etc. Other departments: Cinematography of the film is good with a consistent color tone and with different framing. Background music reminds us of Hollywood detective films (especially Sherlock Holmes series and Alfred Hitchcock movies). Dialogues are alright. Editing is fine. Sets are good with hero’s room stocked with innumerable books. The action sequences are different, especially the one with mouth organ. The climax fight in mangroves offers variety. Production quality of the film is good. Analysis: Watching this ‘Detective’ film is like reading a detective book. It starts with a few deaths and ends with all these deaths being interlinked and directed to one person. Plus points of the film are screenplay and Vishal. On the flipside, the orientation of the film is eccentric and might not interest everybody. After Jagga Jasoos I have seen another film that takes the approach of book-reading while narrating a film. Watching Jagga Jasoos is like reading a comic book and watching Detective is like reading a detective novel. It might be boring in parts due to orientation. You may watch it if you are interested in reading detective novels.